The highly anticipated new stage adaptation of the hit Disney film Frozen officially opens at Broadway's St. James Theatre on March 22. Directed by Tony winner Michael Grandage and choreographed by Tony winner Rob Ashford, Frozen began preview performances on February 22. Broadway veterans Caissie Levy and Patti Murin star. Frozen centers on two sisters who are pulled apart by a mysterious secret. As one of them (Levy) struggles to find her voice and harness her powers within, the other (Murin) embarks on an epic adventure to bring her family together once and for all. Frozen features a book by the film's screenwriter and co-director Jennifer Lee and a score by the film's Oscar-winning music makers Kristen Anderson-Lopez and Robert Lopez. Joining Levy as Elsa and Murin as Anna are Jelani Alladin as Kristoff, Greg Hildreth as Olaf, John Riddle as Hans, Robert Creighton as Weselton, Kevin Del Aguila as Oaken, Timothy Hughes as Pabbie and Andrew Pirozzi as Sven. Audrey Bennett and Mattea Conforti rotate as Young Anna along with Brooklyn Nelson and Ayla Schwartz rotating as Young Elsa. Alyssa Fox is the Elsa standby and Aisha Jackson is the Anna standby. The cast of Frozen also features Alicia Albright, Tracee Beazer, Wendi Bergamini, Ashley Blanchet, James Brown III, Claire Camp, Lauren Nicole Chapman, Spencer Clark, Jeremy Davis, Kali Grinder, Ashley Elizabeth Hale, Zach Hess, Adam Jepsen, Donald Jones, Jr., Nina Lafarga, Ross Lekites, Austin Lesch, Synthia Link, Travis Patton, Adam Perry, Jeff Pew, Olivia Phillip, Noah J. Ricketts, Ann Sanders, Jacob Smith and Nicholas Ward. 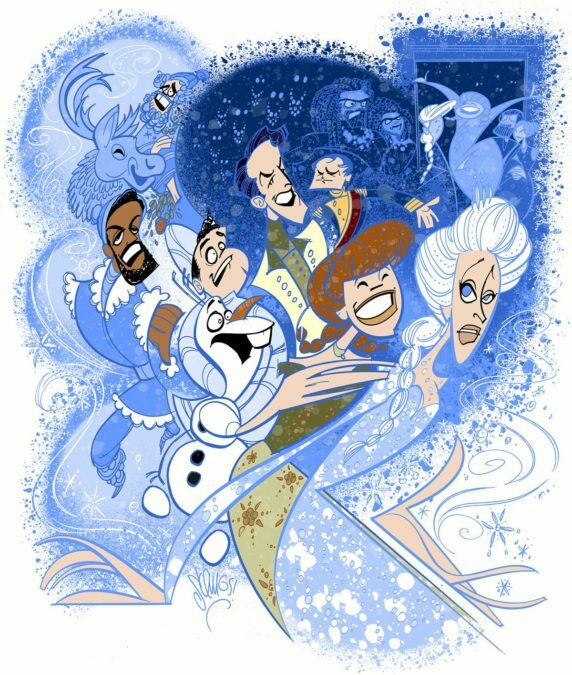 To celebrate Frozen's Broadway premiere, Broadway.com Resident Artist Justin "Squigs" Robertson sketched a portrait the talented cast of characters bringing a beloved story to Broadway audiences. About the Artist: With a desire to celebrate the magic of live theater and those who create it, and with a deep reverence for such touchstones as the work of Al Hirschfeld and the wall at Sardi’s, Squigs is happy and grateful to be among those carrying on the traditions where theater and caricature meet. He was born and raised in Oregon, lived in Los Angeles for quite a long time and now calls New York City his home.